Jonathan Haidt describes the Elephant & Rider metaphor in the Happiness Hypothesis. The elephant is all of the machinations of emotions and neuropeptides and unconscious and subconscious processes. Everything that happens before word gets to the rider is done by the elephant - fear, physical and emotional calculus. Let's call this all Elephant Calculus. I've been trying to come up with a name for the preconscious elephant decision making process. 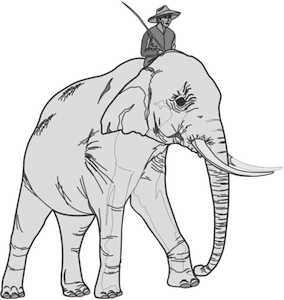 RSA Animates video featuring the Elephant & Rider. p. 9 - You will catch the rider confabulating in later chapters. Confabulating is the process of the rider taking credit for making decisions and inventing stories about why they were made. So, no immediate free will, only reacting when we can be as contemplative, then we have bit of free will. We can only "live our values" thru training the elephant such that its calculus and behavior match our values. Elephant Calculus. The extent to which we have trained our elephant is the extent to which we have free will. For planning, we can imagine and articulate alternatives. Elephant has an automatic "like-o-meter" and negativity bias. There is a lot of overlap between Kahneman's Thinking, Fast and Slow with the fast thinking done by the elephant and the slow thinking done by the rider.